Highest volume players could see rewards reduced by up to 85%. 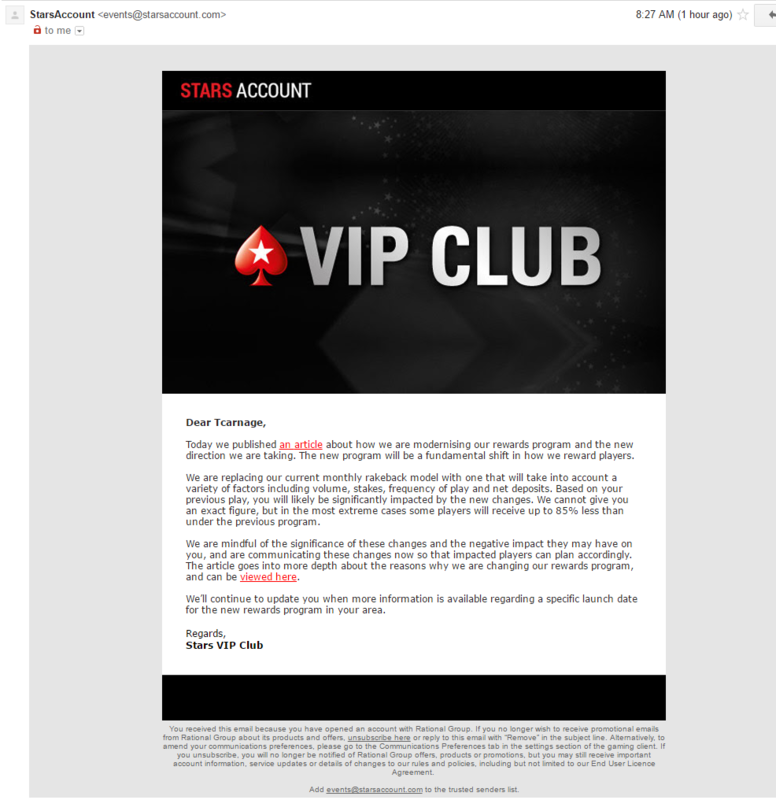 The long-awaited revamp of PokerStars’ VIP rewards program will start rolling out in June, the company has announced. The system will replace the current decade-old “volume-driven” loyalty program with a personalized system of awarding random prizes. In a corporate blog post, Severin Rasset, PokerStars’ Director of Poker Innovation and Operations, gave up few new details on the specific of how the new rewards program will work. He reiterated that the new program will dispose of the current volume-based monthly cycle, and instead focus on a single play session. It was also restated that it will reward play on the casino and sports verticals. Emails have been sent to players “whose rewards are likely to be significantly decreased under the new program,” it was said. These emails, shared on social media, have revealed further details: This “fundamental shift” in the VIP program will, “in the most extreme cases,” reward 85% less to certain players, they were informed. With the current cap of 28% of rake returned to players under the Supernova VIP program, the suggestion is that rewards could drop to less than 4.5% for some players if their play style does not change. Certain details were also revealed regarding a timeline for rollout. Rasset stated that the program will trial in Denmark in late May, with other countries joining throughout the summer. It appears Italy is also on a fast track. An email to players suggested that it will roll out by the beginning of June. The revamped VIP rewards program is a cornerstone of Amaya’s plans both to stabilize the ecosystem of online poker and to promote cross-sell to its growing online casino and sports division. Rather than focus purely on volume when rewarding players, the new system will consider a variety of factors—including stakes played, the frequency of play and overall net deposits. PokerStars embarked on the process of reworking their VIP program in 2016, introducing changes that reward higher volume players less, and investing instead in promotions to draw in new players. It scrapped the iconic Supernova Elite VIP tier and capped the highest rewards at 30%. A new StarsCoin currency replaced the old loyalty points and a VIP steps system was introduced. It replaced “milestone” rewards that paid out for reaching high volume with promotions like Million Dollar Freerolls, which were open to new players.